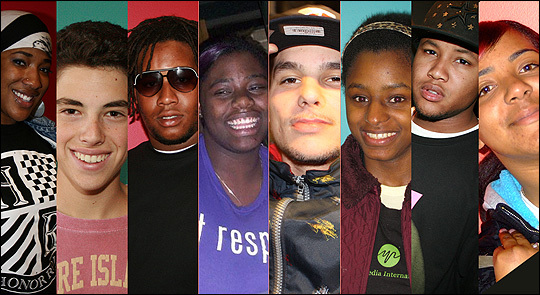 Youth Radio Commentators On Childhood's End When one door closes, another opens. The transformation from childhood to adulthood is no different. Youth Radio contributors share these thoughts on bidding adieu to childhood. When one door closes, another opens. The transformation from childhood to adulthood is no different. Youth Radio contributors share these thoughts on bidding adieu to childhood. Youth Radio commentators have provided a wide variety of essays for Day to Day over the years. This is Day to Day. I'm Alex Cohen. I'm Madeleine Brand. You know, for every ending, there's also a beginning, like when a child becomes an adult. Our friends at Youth Radio have these thoughts on growing up. Mr. JOSHUA RAFEMAN(ph) (Youth Radio): Being dependent on someone is truly a luxury and growing up, you're losing that. Ms. VENUS MORRIS(ph) (Youth Radio): I remember those days, and I do cherish the moments. I could fall, rip my pants, go home, cry to my mama. She'd clean me up, throw on some new pants, bam. If I do that now, I'm going to be mad because I'm out of some pants. Mr. BRANDON MACFARLAND(ph) (Youth Radio): Whenever I get sick, I think about how I used to be taken care of, like pops would make, like chicken noodle soup. He would make it from scratch with chickens. It's a good cushion, and once that cushion is gone - like, I figured out I don't know how to take care of myself when I'm sick, at all. Ms. AYESHA WALKER(ph) (Youth Radio): The one thing that really made me feel like I was a super adult was when my grandmother passed away. And my mom, she was - she's strong but for some reason, she just couldn't pull herself all the way together. I remember having to arrange for the obituaries to be done. I had to write them, I had to, like, to take a lot of responsibility that came with my grandmother's death. Mr. ORLANDO CAMPBELL(ph) (Youth Radio): I was ready. I was ready to do anything that was adult. Like, I was the first one of my friends to get an apartment. And my house ended up turning to something like a youth hostel/homeless shelter. Like at one point, honest to God, there was six people sleeping in a studio apartment. I have no food in my fridge except some cheese and, man, this is what it feels like to be grown up. Ms. AMINA JAMES(ph) (Youth Radio): When we're kids, we think that, man, I wish I was an adult so I can buy this, so I can be able to do that. But then you still kind of miss being a kid again and just going outside, playing tether ball, double-dutching. Enjoy it while it last because it is so short. That is like the shortest part of your life. Ms. SHAKILA WILLIAMS(ph) (Youth Radio): When I was 10 years old, my mom started doing drugs, and at the time my little brother was born. And she wasn't really focused on him, so that's the time I felt like, I can't really just go outside and play in the playground and do this anymore because I have to change diapers and make bottles and put the baby to sleep. So, in my mentality, I think I've been grown since 10. Mr. LEON SYKES(ph) (Youth Radio): I realized I was grown when I was trying to ride a bus at 19 with a youth bus pass, which was 17 and under. And the bus driver knew I wasn't 17, and he kept grilling me and I kept telling him I have no ID. And he made me get off the bus because I had no money to pay. That's when I realized I was grown. It's like, damn, I'm older now. It's time for me to start wising up. BRAND: That was in order, Joshua Rafeman(ph), Venus Morris(ph), Brandon McFarland(ph), Ayesha Walker(ph), Orlando Campbell(ph), Amina James(ph), Shakila Williams(ph) and Leon Sykes(ph). They're all between the ages of 16 and 23. And they live in the Bay Area. Young people bidding farewell to youth - that was produced by, who else, Youth Radio's Orlando Campbell, with Brett Myers.